After being down 2-1 in the Lebanese Futsal Championship final series, Bank of Beirut came back, under the supervision of head coach Dejan Djedovic, to win the series 3-2 and be crowned, once again, as the league champions. The crowning came after a tough 5-3 win over rivals Al Mayadeen last night. The fifth and final match saw a huge fan turnout, with both teams being up to the occasion and delivering some incredible performance. The game was far from being a disappointment to the thousands of supporters who made it to the Emile Lahoud stadium hours before kickoff, and definitely put a wonderful end to an exciting season. The absence of the Bank of Beirut star’s Alee Sisi Tneish and goalkeeper Hussein Hamadani, who both excelled all throughout the series, did not affect the performance of their teammates. Neither did the fact that the team turned to its third goalkeeper, Ghadi Abi Akl, due to the absence of the first 2, the first for having 3 cumulative fouls and the second due to injury. On the contrary, the BoB guys showed why they were and remain the champions of the league. 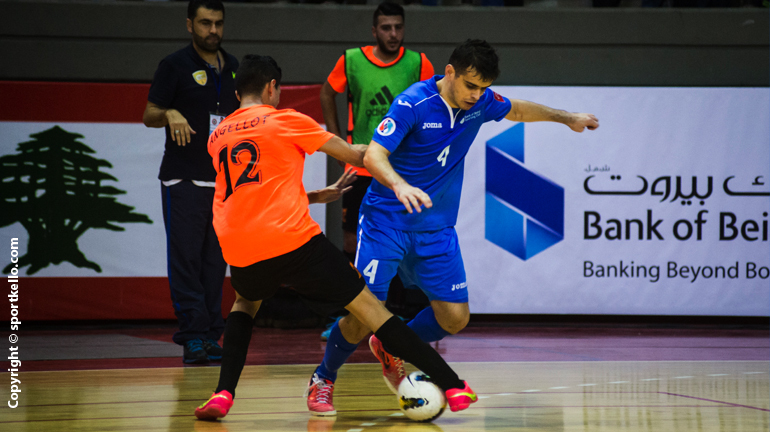 The first half saw three goals for Bank of Beirut and an orphan goal for Al Mayadeen. Yasser Salman, Jhonny Koutany and the Croatian Vladan Vesic (penalty) each scored for BoB in this half, while Ramzi Abi Haydar scored for Al Mayadeen. In the second half, just when everybody thought the game was heading towards an easy win for the Bank, Hassan Hussein scored the second goal for Al Mayadeen after some great personal effort from the Columbian Angellot Caro, going from a 2 goal gap to a 1 goal gap. Vladan Vesic, kept the Mayadeen player’s excitement low with scoring a penalty after a foul commited by Mohammad Dakik, who was sent off. The fourth goal for BoB did not stop Angellot from scoring his first and only goal of the night and the final and third goal for his team. With 2 minutes left to the end of the game, Al Mayadeen’s coach adapted the “Power Player” strategy, which came as a blow for the team when BoB’s Ahmad Kheireddine took advantage and scored into an empty net, ending the game 5-3. Missing the game from Al Mayadeen was one of its best players, Karim Abou Zeid, who was struck by an injury.